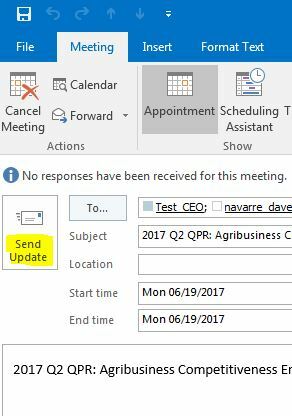 Another task in our migration to Outlook as the mail client is creating Outlook calendar entries and meeting notices directly from the Notes client. Fortunately, it’s been two years since I wrote about how to do this in the UI in Notes, so I don’t feel like that was wasted time. I was exciting to solve the problem and… oddly enough, solving this one was fun as well. It helped that creating an iCal entry is far simpler than the gyrations we had to go through to create one in Notes. As noted previously, there aren’t a whole lot of required values to generate in order to have an ICS file that you can open in the UI as a meeting notice/calendar invite. Now, keep in mind that this iCal file is a mere fragment. If you sent that file to someone, they get the same behaviour you get — it thinks they’re the meeting organizer and doesn’t save it to their calendar unless they send the ‘update’. The key parameter we leave off is that we don’t set METHOD, since setting that to PUBLISH or REQUEST proved problematic in the Outlook client. If we leave it off, Outlook will allow us to treat it like a brand new calendar entry we’ve created, except that the send button will say ‘Send Update’. First, the calendar and event objects are encapsulated. Nothing fancy there. Then we have our start and end times, formatted with date first (YYYYMMDD) then a separator (T) and then the time (HHMMSS). You can include time zone information, but we’re creating this in Outlook and allowing the UI to finish everything for us. So, if the user wants to change the time zone, they can do that in Outlook. The one required value for our needs in the attendees is the mailto value. Without that, it won’t know who to send the invite to and it simply ignores any other item in that list. ROLE is not required and can be CHAIR, REQ-PARTICIPANT (required participant), OPT-PARTICIPANT (optional participant) or even NON-PARTICIPANT (for FYI only). PARTSTAT is not required. There are several values for an attendee in a VEVENT for their participant status, but we’re only concerned with two. Either “NEEDS-ACTION” for attendees that we don’t know when we create the meeting notice whether they’ve agreed to attend or “ACCEPTED” which we’d typically only use for the person creating the meeting notice. CN is, of course, familiar to us as Notes developers, but it applies here to whatever will be displayed as the attendee name. In my experience, Outlook can parse the abbreviated name and display just the attendee’s common name. That might be our Outlook configuration, but I would assume it’s common. RSVP would be either true or false, indicating whether you want a response from the attendee. In my case, we always want it from the attendees, other than the current user. I got fooled by this one. In my sample ICS files, I thought there was just an odd carriage return, but the DESCRIPTION value is basically the body or details of the event, while the SUMMARY is what appears in the subject line for the meeting. I’m guessing that Outlook computes the unique meeting ID itself, but in my code, I generate from the Notes document’s unique ID and then, in order to ensure that subsequent meetings concerning the same document get different IDs, I’m appending a creation time-stamp. So, the agent I wrote that generates the new meeting notice is pretty straight-forward. The getEmailAddress function was described and detailed in a prior blog post and my Utilities script library only provides the logging functions here. Like my mailto agent, this one relies on the creation of a file in the Notes data directory and opening it using a browser. reason = "This will create a meeting invite for you to send to participants." reason = reason + Chr$(10) + "The QPR will switch to read-only mode." reason = reason + Chr$(10) + "If you close and re-open it, you can edit it again." reason = reason + Chr$(10) + "Continue?" fileName = dataDirectoryPath & "\QPRInvite.ics"
The getMeetingTime function just returns the requested date-time in the format YYYYMMDDTHHMMSS, so it can be included in the creation of the ICS file. getMeetingTime = getMeetingTime & "T"
reason = "Function getMeetingTime: "
There is hope for the Notes gurus of old. We just have to keep learning!